Recreational poker player Jason Corn managed to overcome tough competition and more than a few professionals on the final table at the ninth event of 2018/2019 WSOP Circuit Horseshoe Council Bluffs on Thursday. 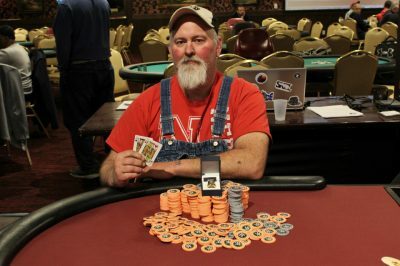 Corn, 54-year-old truck driver from Moorhead, Iowa, won the tournament and claimed his first Gold Ring. The two-day $400 No-Limit Hold’em Big Blind Ante kicked off Wednesday as part of the 2018/2019 WSOP Circuit Horseshoe Council Bluffs in Iowa, that is currently taking place in Council Bluffs, Iowa. This was the ninth out of thirteen events in the main schedule and it managed to attract only 66 players. The modest entry field contributed to a total prize pool of $21,780, which was divided among the top seven participants. Only 10 players survived to return to the second day of the tournament and not all of them would make it to the money. Jason Corn emerged as Day 1 Chip Leader with a stack of 176,000, followed by two-time gold ring winners Ryan Phan (148,500) and Will Berry (132,000). Bernard Lee, who also has a gold ring in his collection, was the fourth biggest stack with 128,500 in tournament chips. Day 2 started Thursday at 2:00 p.m. with Level 17: 2,000/4,000 – BB ante 4,000. Only twenty minutes into the action, Chuck Marty was eliminated, while Corn and Phan had already boosted their stacks with just a few successful moves. The official final table was set up and the next players to bust without cashing in were Matthew Stein and Paul Cogliano. The guaranteed minimum cash went to Stephen Buell who finished 7th and took home $1,119. He was followed by Christopher Bibb (6th, $1,328), and Curtis Biloki (5th, $1,665). Will Berry was eliminated in the 4th place and received $2,211, while Phan busted in the 3rd position getting $3,123 in cash. By the time when Corn and Lee remained for the final heads-up, the truck driver already had a great advantage over Lee and managed to easily defeat him, securing the first WSOP Circuit Gold Ring in his career along with the first-place prize of $7,623. For his runner-up position, Lee received the nice $4,711 in cash. The $400 NLH Monster Stack was running for two days alongside the $400 No-Limit Hold’em Big Blind Ante during the 2018/2019 WSOP Circuit Horseshoe Council Bluffs. The 8th event in the schedule, however, managed to draw in a larger entry field – 293 in total, and to gather a significantly greater prize pool of $96,690. After Day 1 was over, 29 players had remained but only one of them had a stack of over a million. This was Hamid Izadi, a two-time gold ring winner who started the second day with the chip lead (1,091,000). With 974,000 in chips, James Pupillo was following closely. The 30 best players too cash prizes at the guaranteed minimum of $656. Surprisingly, after a long, grueling day of poker, Pupillo busted in the 7th position for $3,396, while Hamid Izadi was eliminated in the sixth place, taking home $4,388. 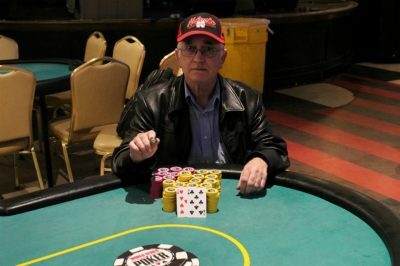 Bernard Morrow from Grand Island, Nebraska managed to survive until the end and win the tournament, receiving a cash prize of $23,198, along with a WSOP Circuit Ring.